this. cake. oh my god, this cake was good. i wanted to say my mom said it was the best cake i have ever made, but i am starting to think she says that every single time i have her taste test my newest recipes so maybe it is time to pick a new taste tester. what can i say though, mom's are always going to be our number one fans! she had a point though... this cake is FULL of coconut & turned out so moist. seriously, if you are a coconut lover you need to make this right now. 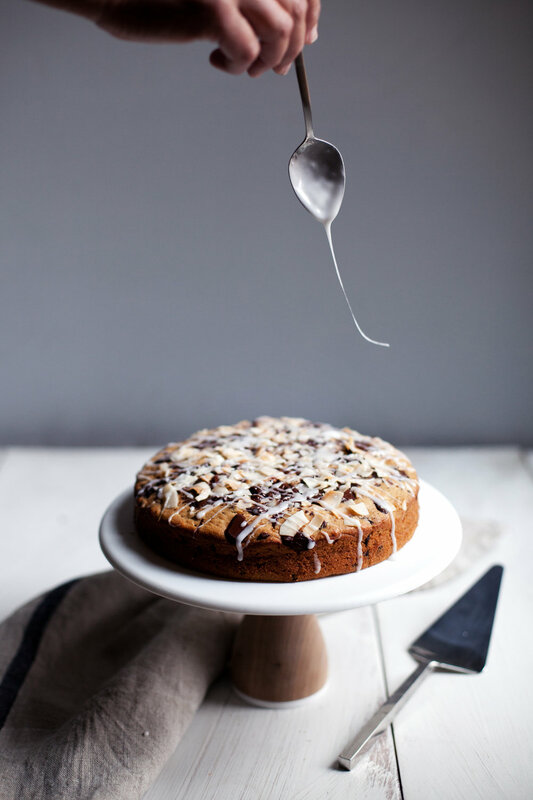 it contains grace's coconut chips, shredded coconut, coconut oil, coconut milk in the cake itself & is topped with a creamy coconut glaze. not to mention some dark chocolate chunks to tie it all together. baking with coconut sugar is a healthier alternative to using regular white sugar. i often rotate between this & raw sugar in all my baking. i think it makes for quite the presentation if you are bringing or serving a dessert at a holiday party! much less stressful then trying to frost a perfect layer cake & i love putting a fancy glaze over top. i used all of grace foods organic coconut products in this recipe, which you can easily find in the international section of your local grocer! they are my go to brand for when i buy coconut milk, it is high quality & affordable. my only real suggestion is to buy extra coconut chips for the topping because good luck not eating them while you bake. they are addicting & i couldn't stop. now get to it! in a large mixing bowl sift flour, baking powder & sea salt. in the bowl of a stand mixer fitted with the paddle attachment cream the sugar, butter & coconut oil until smooth. add the eggs one at a time, followed by the vanilla extract. alternate between adding the coconut milk & flour mixture. beat until smooth. fold in the flaked coconut & half of the chocolate chunks. 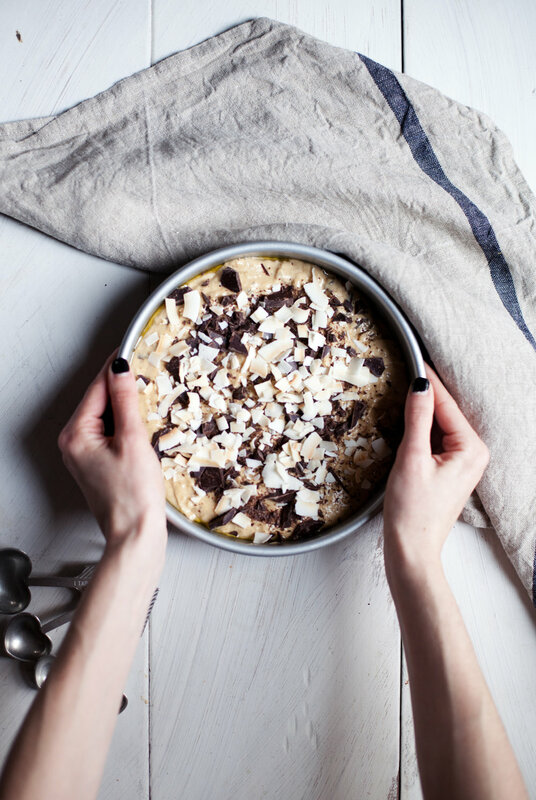 pour into a greased 8-inch round cake pan & top with remaining chocolate chunks & coconut chips. bake for 30-35 minutes, or until the top centre bounces back to touch. let cool completely before removing from pan & glazing. mix ingredients in a bowl until the desired consistency is formed. if the glaze is to thin, add more powdered sugar. if the glaze is to thick, add more coconut milk. this post was created in partnership with grace. they make just about every coconut product you can think of... sugar, oil, chips, milk & so on. 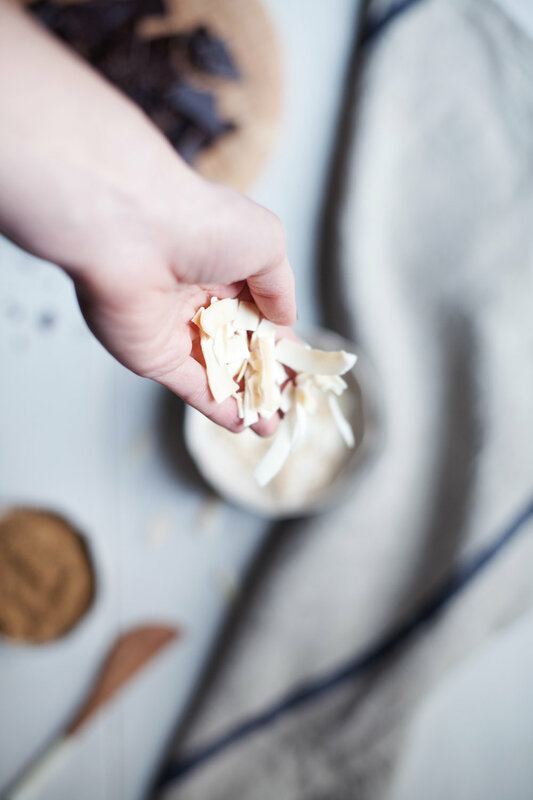 i couldn't help but make the ultimate coconut cake using ALL of these delicious coconut ingredients! thank you for supporting the brands that keep me doing what i love.